Anytime Fitness has more than 3,000 gyms and 3 million members worldwide, so when they got in touch and asked us to help them make a cool, modern and engaging promotional video Cheshire of their latest gym in Knutsford, we jumped at the opportunity! 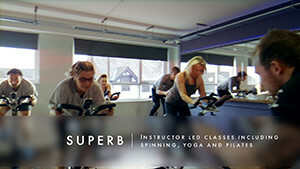 The brief for the video production involved creating a video that managed to both showcase the gym’s brand new and state-of-the-art equipment whilst also highlighting the homeliness and welcoming nature of the Knutsford branch, making it a great gym for serious gym bunnies and newcomers alike. To achieve this in the video we used some of the latest camera stabilisation technology (the DJI Ronin) to create a video of movement through the gym, whilst also creating some clean and crisp motion graphics to highlight the key features of the gym. We’ve had some great feedback for the video and as a result we are now in the process of producing more promotional videos in Cheshire for Anytime Fitness gyms.